Soopa’s 100% coconut dog chews are an excellent source of fiber, powerful anti-oxidants, vitamins, minerals and amino acids. 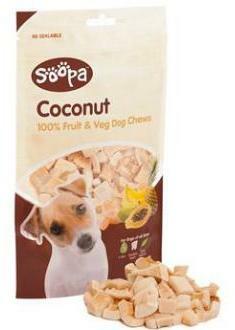 Made from 100% fresh coconut meat, with NO sugars, salt, preservatives or chemicals added. 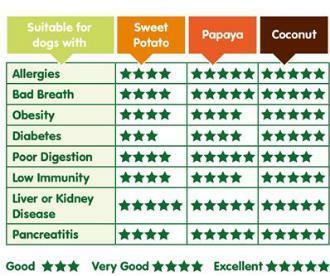 Dogs love the tropical taste and coconut also acts as a natural antiviral, antifungal, antibacterial and anti parasitic. By improving the absorption of calcium and magnesium coconut also supports the development of strong healthy bones and teeth. Super nutritious and super delicious.